For those of you who live in/near a city - when did you start training going on public transport? 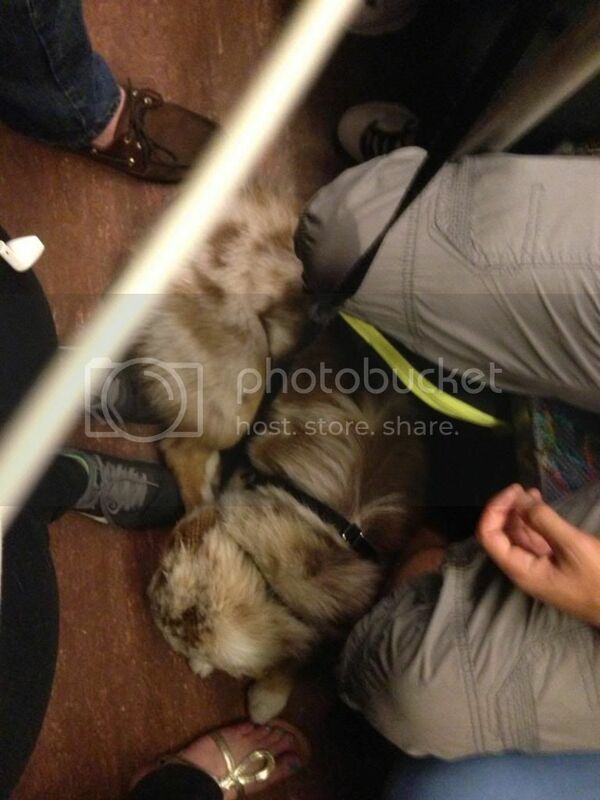 We'd like Chinook to not be afraid of the train/bus/Subway etc. I'd love to start when I can still carry her on the train (Theres generally a pretty big gap between the train and the platform) and after Gipsy slipped into the gap with her hind legs once I'm kind of nervous having her walk on the train on her own the first few times. I have no idea if she'll be too young though when she's small enough - because she's getting huge fast. Well we have had many experiences like this with my brothers dog freckles. First u need really good treats the dog likes, then you start far away and begin to inch them closer and u must keep their attention, If this fails don't give up keep trying! I hope this was helpful! Started a few days after I got him I started by sitting on the platform and just giving him treats (the train is really loud) so we just hung out and did treats while trains came and left..
these days.. this is Merlin during rush hour :rofl1: perhaps he is a bit too comfortable with the train? oh and bring bags and wipes.. some dogs get sick with the strange motion and you will want to be prepared just in case!